Buying a bike can be a big decision, as they aren’t always cheap. Like anything, you really get what you pay for. 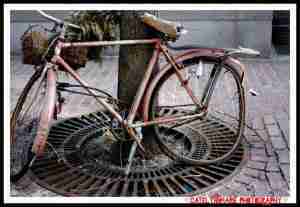 However, there are some tips and tricks to purchasing a good second-hand bike for less money. Sites such as Gumtree or Facebook MTB buy and sell have some really great deals to look out for, so be fast! When buying a second-hand bike, the biggest thing that can help you, is KNOWLEDGE! Without knowledge, you are taking a massive gamble when buying second hand. Does it need more work? Will it be rideable? Am I getting ripped off? When buying a bike, its important to get a size that fits you! There are websites, with good size guide tables, however, there are a few ways you can go about it. The first test, is sitting down, do your knees hit (or get close to) the handlebars or forks? You generally want around half a foot between your knees and the bars. Next, you want to be able to lift your seat up to a level which allows you to sit down, with your foot on the pedal, rotated downwards. If your leg on the pedal is nearly fully extended, then your seat-post is a good size for you. This allows you to pedal uphill with much more ease. To check out the front suspension forks on a bike, inspect the smooth upper surface of the suspension forks. There should be no scratches, or discolouration in the stanchions. If there is, the seals are probably worn, and fluid can leak/become contaminated (an expensive fix). Another test, is to hold the handle bars, and pick up the front end of the bike. If you feel some play from resting point, to up in the air, this can indicate worn internals, and therefore will need attention (a very expensive fix). One last test, simply compress the forks. A well maintained fork should produce zero to little sound when compressed. If there is a sound of liquid moving when compressed, it probably needs a service. Suspension needs to be observed on any second-hand bike! A rear shock is generally a very neglected part of most bikes. On more “high-end” bikes, a rear shock wont take much maintenance, as they are generally very well sealed and protected. However, it is still important to check, as it can be extremely costly if something is broken, rusted, or not working silently. First test is to simply sit down on the bike. Make sure it compresses and returns fairly quietly and smoothly (make sure the shock isn’t locked, as some rear shocks have a lock out setting to prevent rear shock movement). Next, grab the shock and rock it back and forth, to feel for any movement. If there is movement, it can either be loose mounting bolts (which just need tightening), or internal wear (which is expensive). Make sure you know which it is. Lastly, check the overall look of the rear shock. Is it scratched? Dirty? Is it rusted? If so, consider how much you want to spend on the bike after purchasing it! Now the most expensive, and perhaps most important part… the frame! The frame is what takes the beating, and most of the falls! 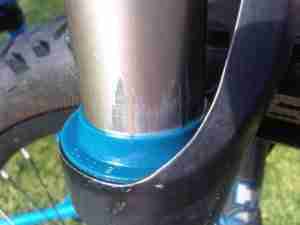 Start by going overt the bike frame at any joints or welded areas (generally at any corner or bend in the frame). Check to see if there are any cracks there, or forming. If there is, then it is advisable not to get the bike. Next, look for tape marks, or covered areas. Some owners may hide cracks with tape, or stickers, to make the bike look better, or neater. Lastly, look at the paint. If its scratched, discoloured, etc. If you want a good looking bike, scratches are hard to avoid! Just about all second-hand bikes will have a small mark or two. To check the bearings on a bike, there are numerous ways you wan test them. Beginning at the front of the bike, grab the top of the bike wheel, and the handle bars, and try rocking the wheel side to side. If there is movement, it could be worn bearings, or the cone nuts need tightening. Second, hold down the front brake, and rock the bike back and forth, feeling for play in the head tube of the bike (testing your headset bearings). Play in these bearings could indicate loose bearings, or worse; worn out bearings. Moving further back, grab the back of the saddle (seat) and lightly lift the bike off the ground, feeling for play in the frame bearings. If there’s a slight notch in the lifting of the bike, there could be a loose bike joint which needs tightening, or it could be an old worn bearing. Lastly, the back wheel. As it was done with the front wheel, grab the top of the tyre, and the seat stay, and rock the wheel back and forth, again feeling for play. Wheels are very rarely completely true (straight). The best way to see is to hold a portion of the frame, and point out your finger. Spin the wheel, and see the rim roll past your finger, using it as a gauge. Notice if the rim moves away or towards your finger. If its a little wavy, that is to be expected. However, if there is a noticeable dent, or ding in the wheel, it may need some heavier work, and therefore can add up the cost. Repeat this for the front wheel also, however grabbing the fork leg instead. Gears and brakes are an important check to make, as replacing these can be a headache. The best way to do so is to take the bike for a test spin. As you ride, shift through the gears, up and back through the full range of gears, and see how smoothly it shifts. If it’s not shifting smoothly, it can mean the derailleur needs adjusting, is worn, or the hanger is bent, and will need replacing. 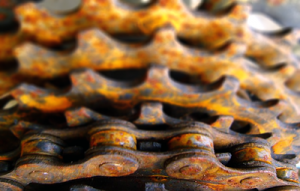 Also, check the chain and rear cassette (cogs) for rust. Do the same with the front derailleur if applicable. The brakes are generally a simple check. Roll at a fairly high speed, and softly squeeze the levers, feeling for a firm lever (as apposed to spongy feel). If they are a hydraulic brake, and feel spongy, then they may need bleeding, which can be a bit pricey too. However, poor feeling mechanical brakes are a much easier fix. Also, check the brake system (calliper, lever, and hose lines) for any wear, ripping, or cracks. It is advisable to consider cost of replacing old and broken parts, when buying second hand. Lastly, is the bike clean? A good assumption that can be made, is the cleanliness of the bike. If its reasonably clean, you can have an idea of how well the owner looks after the bike. As the saying goes, “a clean bike is a happy bike!” Also, check out the seller. If they seem dodgy, there may be a reason they’re selling the bike! Does the bike still need cleaning anyway? Check out my article on cleaning a bike for more information! Make sure you are completely happy with the bike before buying it! If there is anything that will need replacing or going over, make sure you know what your in for, before buying.